I love whiskey. I offer here a simple dedication to the wonder that is whiskey. Whether it is Scotch, Irish, Japanese, Canadian, bourbon, rye, corn, or malt, here are some reviews, opinions, notes, stories, anecdotes, photos, and warnings on my journey to improve my relationship with this mighty invention. Enjoy and share! So last weekend as we ventured in to a local dive bar to play some pool, I asked the bartender which rye whiskies she had and she answered, "Uh, we don't have any... I don't think." I asked, "What's that one there?" (All I could make out was the green bottle and the word RYE.) She produced a bottle of George Dickel Rye, and from there the evening just continued to get better. If the name George Dickel is unfamiliar to you (as it was me), you just aren't paying attention. Dickel has been making a name for itself in the whiskey world since around 1870. Dickel's Old No. 8 Brand whiskey competes for the same market as Jack Daniels Old No. 7. Founded in the small town of Cascade Hollow, Tennessee, George Dickel is a small-batch whisky brand that has continued to grown for the past 140 or so years. Dickel produces five whisky variations, including George Dickel Cascade Hollow, Old No. 8 Brand, Superior No. 12, Barrel Select Tennessee whiskies, and now George Dickel Rye. According to Larry Olmsted, contributor to Forbes.com, "The rye revival keeps getting better and better..." Personally, I couldn't be happier to see a resurgence of rye whiskies. Next to some of my favorite bourbons, there is nothing that I can rely to enjoy as well as the taste of a new rye whiskey. I really enjoyed the Dickel Rye. The evening consisted of rye whiskey, beer, water, and pool and this spicy spirit was quite memorable. Researching the pricing online I found that bottles run around $20 to $25, very reasonable for this tasty spirit. I thought it would be easier to find another bottle, but apparently, having only come on the market in November 2012, it is still not widely stocked. 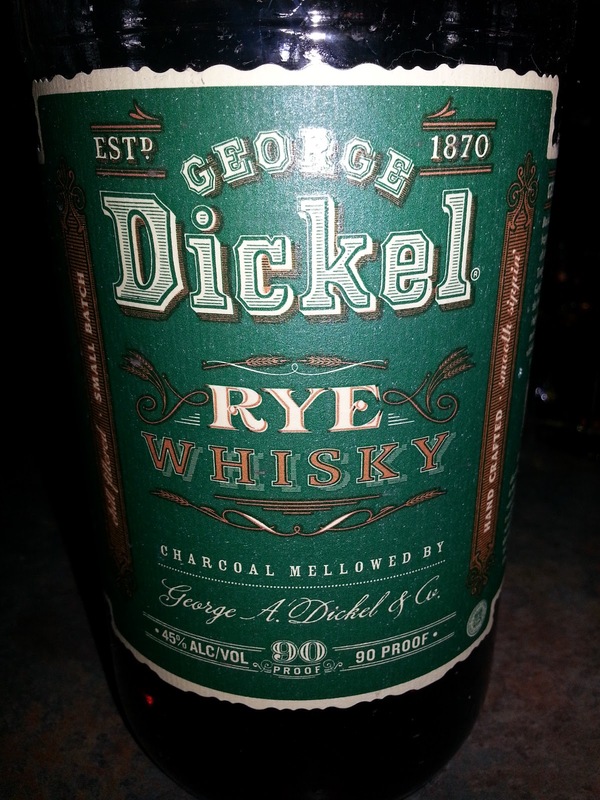 So to sum up, George Dickel Rye is a really enjoyable rye. It is “available” at a bargain price and has a smooth, spicy, warm taste that goes well with an evening of pool and honky-tonk music. It may not have the subtleties or complexities of flavors that one would find in a finer whiskey, but it has a great flavor, is a smooth drink, at a great price. I highly recommend this as an alternative to whatever is the “standard pour” at your bar. Try it neat or on the rocks, chase it with a beer, and may be mix it with some Merle Haggard, Willie Nelson, and The Rolling Stones. Translate The Whiskey King Blog! Copyright 2013 WhiskeyKing.net. Simple theme. Powered by Blogger.